This title is also available packaged with the Enhanced Pearson eText. To order the Enhanced Pearson eText packaged with a bound book, use 0133548635. The foundational concepts of math–and how to implement them in early childhood education–are clearly presented in this practical, unique book focusing on the Big Ideas in early mathematics. 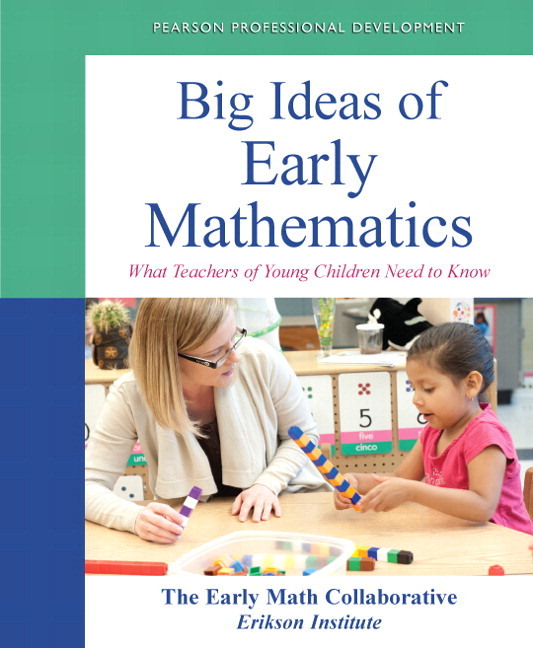 The Big Ideas that convey the core concepts of mathematics are at the heart of this new book that gives early childhood educators the skills they need to organize for mathematics teaching and learning during the early years. For teachers of children ages three through six, the book provides foundations for further mathematics learning and helps facilitate long-term mathematical understanding. It’s the perfect guide for those who want to focus their instruction on mathematics that is central, coherent, and rigorous. In it, readers see clearly why building early foundations in math matters, why teachers’ understanding of foundational math matters, and why the methods used to teach it matter. Developed by the Erikson Institute’s Early Math Collaborative team, the book groups the Big Ideas into nine chapter on topics that are familiar to early childhood teachers–sets, pattern and regularity, number, counting, operations, measurement, data analysis, shapes, and spatial thinking. The work is in keeping with the content strands identified by the National Council of Teachers of Mathematics (NCTM), and maps pathways to help teachers meet the Common Core State Standards for Mathematics. The Enhanced Pearson eText provides a rich, interactive learning environment designed to improve student mastery of content with embedded video. The Enhanced Pearson eText is also available without a print version. "[This book is] a remarkable addition to my Science and Math for Young Children course. At the end of the course, many students shared how much [it] helped them overcome their anxieties about creating math activities for young children that go beyond counting. My students feel much more confident about using new and appropriate language while facilitating meaningful math activities with children." With the clearly presented Big Ideas as a focus, teachers get a better understanding of foundational mathematics concepts, allowing them to become more intentional in teaching, more thoughtful in their curriculum choices and analyses, and more flexible and responsive to children’s mathematical thinking and behaviors. Readers are able to focus their instruction on mathematics that is central, coherent, and rigorous. Teachers see how to unpack content strands identified by the NCTM and map pathways to meet the Common Core State Standards for Mathematics. Readers get a clear sense of the focus of each chapter through the book’s chapter organization, each focusing on one early mathematics topic, and each heavily influenced by the authors’ understanding of early childhood development and cognitive development in mathematics. Understand the definitions of the Big Ideas with teacher-friendly, but mathematically precise language. Anchor each big idea through “Math Snapshots” (classroom scenarios), “Teacher Talk” (reflections and tips), and classroom examples. Use activities for enacting the Big Ideas. Call attention to mathematics-related language. Work effectively with dual language learners. Make connections to children’s literature. Implementing the Big Ideas is made familiar, fun, and possible through the book’s Math Snaphots in each topical chapter, which describe how skillful early childhood teachers help young children grasp Big Ideas, clarify their understanding, and connect math concepts with other areas of learning. Readers get a first-hand look at the Big Ideas in action in the videotaped preschool or kindergarten math lessons for each topical chapter, which show early childhood teachers and children working on Big Ideas through fun, engaging activities, plus the teachers’ reflections on the implementation process. Readers learn from the experiences of over 300 prekindergarten and kindergarten teachers from the Chicago area who have tested the Big Ideas in their own classrooms. The quotes from teachers of young children, called “Teacher Talk,” reflect on personal experiences in understanding and implementing the Big Ideas in the classroom. Practical help for implementing the Big Ideas is featured in the “Implications for Teaching” sections that include activities, strategies, or methods that teachers can put to immediate use in their teaching. Awareness of children’s varied levels of math experience and understanding is aided through the developmentally-oriented chart in each topical chapter, whichgives teachers ideas, skills, or activities that may build on one another among children and in classrooms. Teachers are encouraged to use high-quality literature to support children’s understanding of the mathematical Big Ideas with the help of the Finding Great Math in Great Books feature at the end of each chapter. Each lists several well-loved children’s books that offer high quality illustrations and rich language. Teachers get a clear picture of the authors’ approach to early childhood mathematics through the Key Teaching Strategies that are introduced in Chapter 1, and briefly addressed within each topical chapter, with emphasis on how the strategies relate to specific math content. A companion DVD (within the book) also contains the classroom videos aligned with key chapter content. The videos show teachers and children engaged in thinking about and exploring the Big Ideas. The authors of the book are a group of devoted early childhood specialists working in the Early Math Collaborative (EMC) at Erikson Institute. Erikson Institute is America’s only graduate school focused exclusively on child development and early education from birth to age eight. The EMC aims to improve the quality of early math education and ensure that young children are introduced to foundational mathematics. The EMC provides professional development in early mathematics to nearly 100 preschool and kindergarten teachers each year. Our team works with teachers to bolster their math knowledge and confidence in their ability to teach it in fun, engaging, and developmentally appropriate ways. The ideas presented in this book are the result of a joined effort among the EMC team members over six years. They have been tested through our professional development programs. Together, the EMC team has accumulated over 150 years of classroom teaching and professional development experiences. The team also possesses a wealth of knowledge and expertise in areas such as child development, curriculum design, the development of mathematical thinking, classroom assessment, children’s literature, instructional coaching, induction mentorship, bi-lingual education, and research design, to name a few. Below we present brief biographical sketches of the team members who contributed to this volume. Brownell, Jeanine O’Nan, (M.A.) Assistant Director of Programming for the EMC, Jeanine has extensive curriculum writing experience. She worked at the Center for Elementary Mathematics and Science Education at the University of Chicago. While there, she revised the first-grade component of the Everyday Mathematics curriculum and authored Pre-Kindergarten Everyday Mathematics. Jeanine has many years of experience as a classroom teacher of first, second, and third grades. She also has mentored new teachers and worked as an instructional coach. Chen, Jie-Qi (Ph.D.) Principal Investigator of the EMC, Jie-Qi is Professor of Child Development at Erikson Institute. She has taught preschool, elementary, and middle schools in China and preschool and kindergarten in the United States. She has contributed to teacher professional development efforts for more than 20 years and received the Outstanding Teacher Educator’s Award in 2009 from the National Association of Early Childhood Teacher Educators. Jie-Qi has published six books and numerous articles. Her work focuses on teacher professional development, early mathematics education, school-based intervention, cognitive development, applications of multiple intelligences theory, and instructional assessment. Ginet, Lisa (Ed.D.) Assistant Director of Instruction for the EMC, Lisa has spent more than two decades as a professional educator in various positions, including (classroom teacher, child care provider, parent educator, home visitor, teacher trainer, adjunct faculty) in diverse settings (child care centers, elementary and middle schools, family resource agency, family child care home, community college, private university). In all her roles, Lisa has worked to engage children in active and meaningful learning, to support families as their children's first and closest teachers, and to involve educators in reflective dialogue to help improve their teaching. Hynes-Berry, Mary (Ph.D.) Professional Development Instructor and Team Member, Mary is a senior instructor at Erikson Institute. She has been involved in pre-service and in-service work with teachers and with young children for over 30 years, with an emphasis on early literacy, mathematics and science. She is the author of Don't Leave the Story in the Book (Teacher's College Press, 2011). Her background includes many years of using oral storytelling as the basis of curriculum in schools. Mary credits her work as the project director of Encyclopedia Britannica’s Early Math project for her conversion to understanding foundational mathematics. She is the author of two books and several articles. Itzkowich, Rebeca (M.A.) Program Supervisor for the Project, Rebeca is a senior instructor at Erikson Institute. She has taught preschool and elementary school in Mexico, Spain, and the United States. For the past ten years, Rebeca has provided professional development to teachers in the areas of culturally and linguistically responsive teaching. As a member of the EMC team at Erikson, she has worked to help teachers discover a love for foundational mathematics and provided supervision to math coaches to inspire teachers to become more reflective about their mathematics teaching. Johnson, Donna (M.S.) Teacher Support Services Coordinator for the EMC, Donna has taught elementary math in a private school setting for a number of years. She has provided support to coaches and teachers to strengthen and deepen their understanding of foundational math. For over 10 years Donna has worked with parents, teachers, and child care providers in a variety of teaching and learning situations to promote the importance of creating a high quality learning environment for children. In an effort to further support parents and children, she has overseen an after school program providing group and individualized math instruction. McCray, Jennifer (Ph.D.) Director of the EMC, Jennifer is an Assistant Research Scientist at Erikson Institute. She is a former preschool teacher, with over 10 years experience in teacher training. Her dissertation, which focused on preschool teachers’ knowledge of early mathematics, won two national awards—one from Division K (Teaching and Teacher Education) of the American Educational Research Association, and another from the National Association of Early Childhood Teacher Educators.